Cut four finger limes in half at an angle, crosswise. Gently squeeze “citrus caviar” out of rind into large bowl. Add olive oil, vinegar, lime juice, cilantro, and shallot. Mix well. Season to taste with salt, pepper, and hot sauce. Add shrimp and stir to combine. 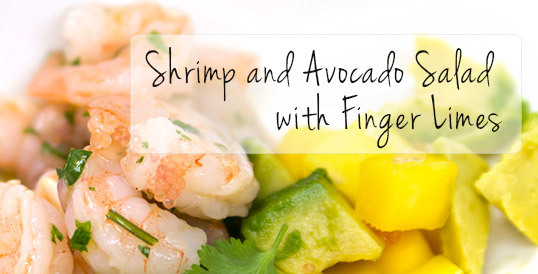 In small serving bowls, spoon in mango and avocado dices, and shrimp mixture, then garnish with finger lime “caviar” and cilantro sprigs.